Vietnam, ooh Vietnam. A country full of history and culture that was on the top of my bucket list of places to visit. Finally, I went backpacking around Southeast Asia for my summer vacation and the first place I visited was, of course, Vietnam. The Vietnamese territory is so long and extensive that it takes too much time to travel from north to south, in my experience one month. The first time I visited Vietnam I did it partially alone and partially accompanied by Mexican friends. I toured part of the north and part of the south, taking care not to leave any highlight aside and with a backpacker budget. And here is what I did that wonderful week of my life. My flight landed coming from South Korea, where I lived, at the Cat Bi airport (NPH) located in Hai Phong, Vietnam. This is not the main airport, nor the closest to the capital but it is an excellent option to take care of your pocket if you come from Korea, Thailand or other points in Vietnam since it is 2 hours by train from Ha Noi, the Vietnamese capital. Personally, I took this option because it was the only flight that arrived in the morning to Vietnam and because my plan was to rest on the train since the night before I spent it at the Korean ICN airport. Once in Ha Noi, after getting lost in the small and busy streets of the Old Quater, I sat down to have breakfast in one of the many cafes in that area. For $3 USD I had a delicious breakfast consisting of a baguette and a frappe, which are a MUST try in Vietnam. The coffee girls, very kindly, allowed me to leave my backpack in the place while I went on exploring Ha Noi. One of the most recommended attractions was the Water Puppet Show, a curious Vietnamese tradition of 50 minutes and that costs $4 USD with live music in the Thang Long Water Puppet Theater. Once it ends, you can walk around Hoàn Kiếm Lake, a large and beautiful lake in which there are several interesting spots, my favorite was Ngoc Son Temple, Hanoi’s most visited temple sits on a small island connected to the lakeshore by an elegant scarlet bridge, constructed in classic Vietnamese style. 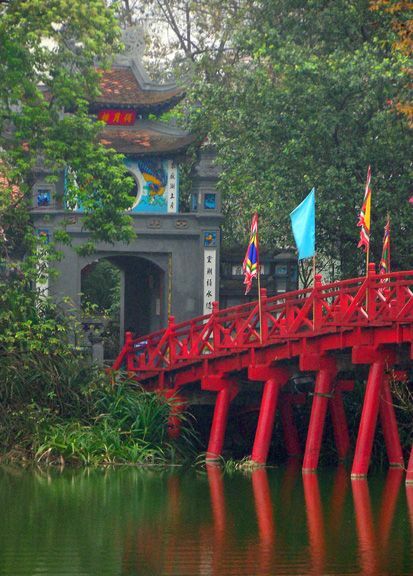 The temple is dedicated to General Tran Hung Dao, who defeated the Mongols in the 13th century, La To, patron saint of physicians, and scholar Van Xuong. After having dinner in Lotteria, one of my favorite Asian hamburger restaurants, I went to pick my backpack and then waiting for the night-train that would take me to my next destination: Sapa. Second night in a row that I do not sleep in a bed, but it does not matter, whatever it takes to explore Vietnam, Sa Pa in particular. The train arrived at 5 am at the Lao Cai station, where you can take a bus to the city of Sa Pa in 3 hours. that’s the main problem with Vietnam; the routes are very long and there are not many options to move from one place to another. 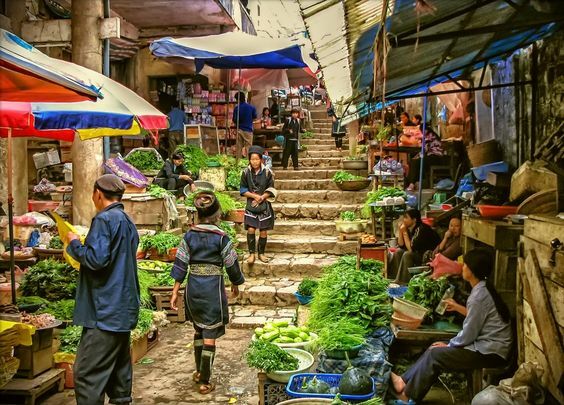 After a fruity breakfast, you can walk from Sa Pa to the Muong Hoa valley, which is worth every step you take to get there. 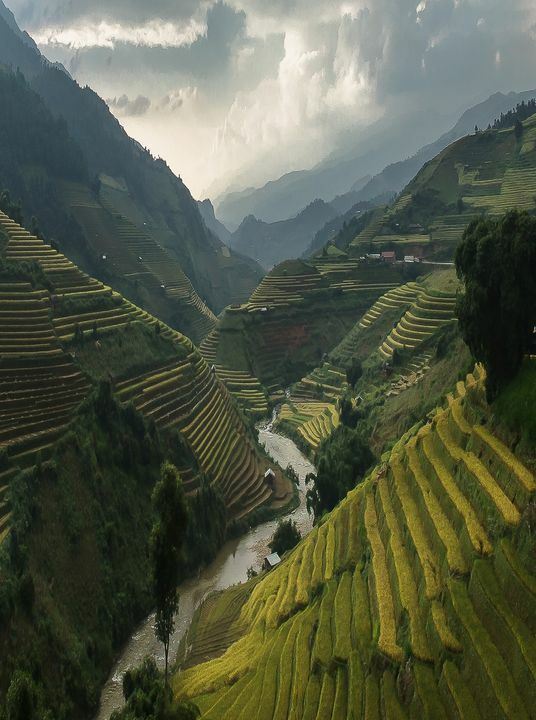 The view is BEAUTIFUL, formed by the Hoang Lien mountain ranges, which allow you to walk through the rice terraces of the north of this beautiful country until you reach the Muong Ha river where you can swim to get into a suspension bridge that takes you to the village of Za. Vietnam, I love you and it’s day 2. The third day, I woke up to have a coffee and watch the sunrise in this mountainous and magical place. After a shower and a consistent breakfast, you can walk through the bamboo forests to the town of Cat Cat. After a meal by the river, you can visit the foot of the Fansipan mountain, the highest in the Indochinese region where again, I was surprised by nature. Back in Sa Pa, I took a shower and picked up my things before returning to the night train to Ha Noi. After another bed-less night, I arrived at Ha Noi early to have breakfast: delicious Pho. 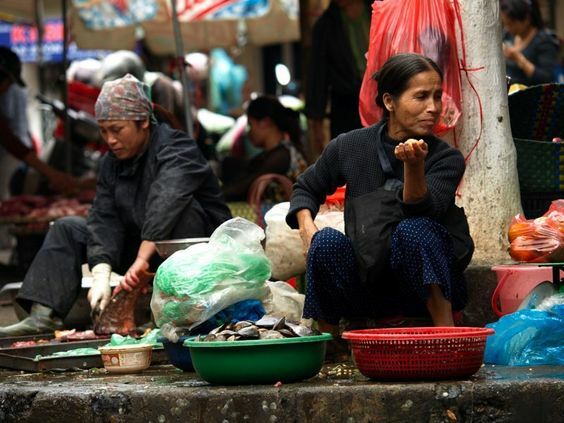 Vietnam’s typical soup that is OMG delicious! 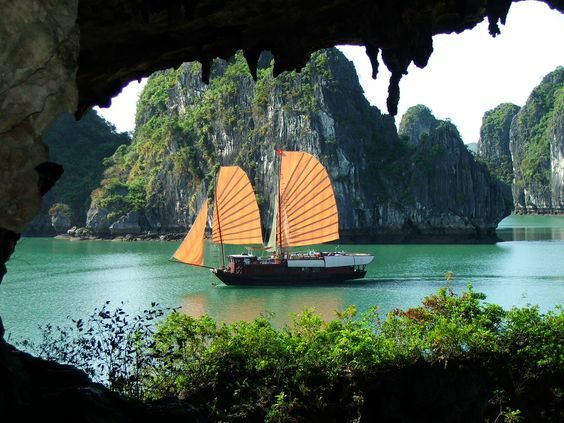 At 10 am I took the bus to Ha Long Bay, which is one of the 7 wonders of the natural world. 4 hours later I took a cruise in Tuan Chau where I had typical Vietnamese food based on seafood and rice. Later I was able to appreciate the Ha Long Bay and go down from the cruise to kayak and swim in the different caves (Hang Sung Sot is the biggest one) and grottos in a green water that refreshes in the more than 30 degrees they do in Vietnamese summer. Spending the night there is a good option, especially if your trip, like mine, is for photographic purposes. After having breakfast and walking a bit more around caves, I went back to Ha Noi where I arrived at my hostel (Hanoi City Rocks) around 3 pm. After a nap and a fresh shower, I went to Đồng Xuân Market, where I bought some traditional clothes and ornaments and then have pizza for dinner, cause yes. I needed a pizza for my project of eating pizza in every country I visit. In my hostel, they offered free beer for one hour every night, and if there’s a place where beer is delicious it is Vietnam. Tiger beer is a MUST try drink at least once in a lifetime. So on the sixth day, my Mexican friends arrived at Ha Noi and encouraged me to rent a scooter for $10 USD the whole day. One thing you notice in the first minute you step in Vietnam is the excessive amount of scooters that transit Vietnamese streets, there are even more scooters than cars. So that day, we visited spots as Literature Temple and Hồ Chí Minh Mausoleum in the north part of Ha Noi. We had lunch by Tay Lake, that is bigger than Hoàn Kiếm Lake and then visited Tran Quoc Pagoda. After that, we went back to our hostel to have free Tiger beer, best beer in Asia. Last day in Ha Noi, the capital of Vietnam. After a breakfast in a small local restaurant, we took the scooters again to a pair of interesting and thought-provoking museums about this wonderful country: Hoa Ló Prison and Vietnamese Women Museum. After talking a bit about the impression left by these two museums, we went to visit and walk the Long Bien Bridge. Designed by Eiffel this bridge crosses the Red River, which is why it was bombed during the war. Before going to the airport and saying bye to my friends, I decided to go around the Old Quarter again on a scooter, buying some souvenirs and my last Vietnamese sandwich at Ha Noi. The International Airport of No Bai is one hour from the city center and you can get there by taking a bus that for $ 2 USD leaves you at the terminal you prefer, in my case the national one, because the adventure in Vietnam is not over yet.